I have been praying for a Word from God and received many yesterday. One thing I read is located in the 38th chapter of Isaiah. In it Hezekiah is crying out to God because he was about to die. From day until night You make an end of me." Hezekiah thought it a travesty to have no heir to his throne and cried out for more years to bear children (as though God could not raise up a suitable successor). His distrust of God lead to the 55 year reign of his evil son Manasseh. This son undid every reformatory thing Hezekiah instituted. He set up idol worship, sacrificed his own son through fire to a pagan god, and slaughtered all the prophets. One of those prophets (according to Jewish tradition) was his father's best friend Isaiah. They say he was sawed in half. I do not want to go out like Hezekiah. 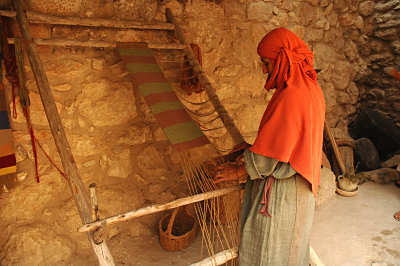 To me, being cut free from the weaver's loom means that you are done and ready to go on for intended use (in this case, to go on to be with Christ). I desire to go on. I desire to be sent on for the intended reason I was made. He says that it is time. The blanket is woven. May we trust in the Lord God to complete His purposes and simply go and do what He has intended for us. May we come fully to the end of ourselves indeed. May we not crave earthly things more than our heavenly Father.